Well this is a new thing I'll be doing from time to time. Seeing as my buddy and I both have iPhone's and we are both car buffs. Why not snap some iPhone pics of cool cars on the road! And to start this off right.. I'm showing up with the big guns!!! 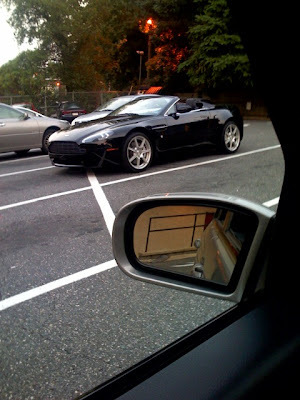 Check out this sweeeeet Aston Martin V8 Vantage Roadster!! WOW is all I can say.. I refer to this as my Lotto car.. because if I won the Lottery, this is the first car I would get! (well.. maybe the coupe version..) What an amazing car!! Its like time stands still and you stare at this car in a Matrix style camera shot.... The best of the best! !